Heavy duty construction. NY approved housing. UL listed for damp locations & meets UL924, NFPA 101 Life Safety Code, NEC, OSHA, Local and State Codes. Heavy 20-gauge steel construction. White powder coat finish (standard). Side and top conduit knockouts. Thermoplastic emergency lamp heads. Dual 120V/277V voltage. Charge rate/power “ON” LED indicator light and push-to-test switch for mandated code compliance testing. LVD (low voltage disconnect) prevents battery from deep discharge. 6V, sealed lead acid, maintenance-free, rechargeable battery. Internal solid-state transfer switch automatically connects the internal battery to lamp heads for minimum 90-minute emergency illumination. Fully automatic solid-state, two-rate charger initiates battery charging to recharge a discharged battery in 24 hours. 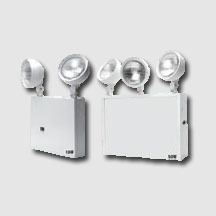 Adjustable, glare-free PAR-Type lamp heads. Optional 3rd head included. 6V model offers 9W lamps, standard. 12V model offers 12W lamps, standard. Remote capability available on 12V model only.